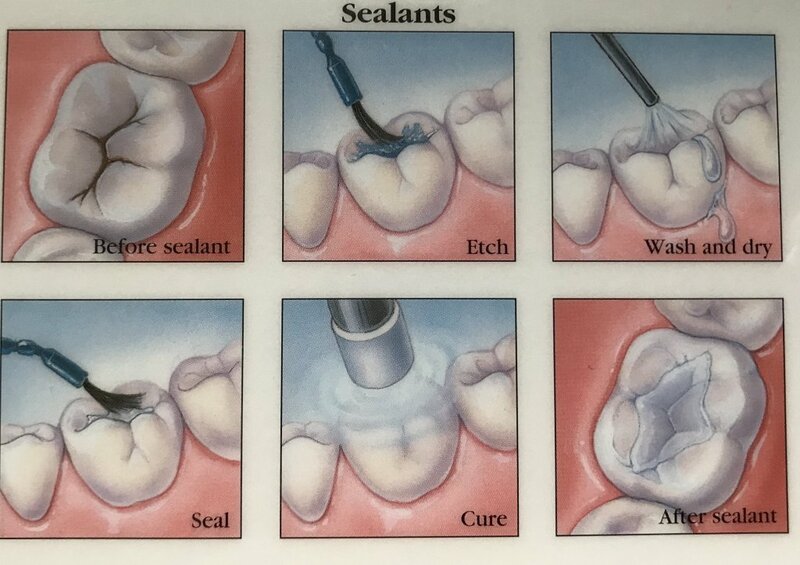 Dental sealants are a plastic coating that is painted on the grooved chewing surfaces of the back teeth. They can keep cavities from forming and may even stop early stages of decay from becoming a full-blown cavity. Children and adults can benefit from sealants, but the earlier you get them, the better. Your first molars appear around age 6, and second molars break through around age 12. Sealing these teeth as soon as they come through can keep them cavity-free from the start, which helps save time and money in the long run. Ask your dentist if sealants are a good option for you and your family. Sealants are recommended for children who have any history of cavities and also children or adults with teeth that have deep pits or grooves. It’s a quick and painless process. Your dentist and or hygienist will clean and dry your tooth before placing an acidic gel on your teeth. This gel roughs up your tooth surface so a strong bond will form between your tooth and the sealant. After a few seconds, your dentist will rinse off the gel and dry your tooth once again before applying the sealant onto the grooves of your tooth. Your dentist will then use a special blue light to harden the sealant. There are no known side effects from sealants, with the exception of an allergy that may exist.